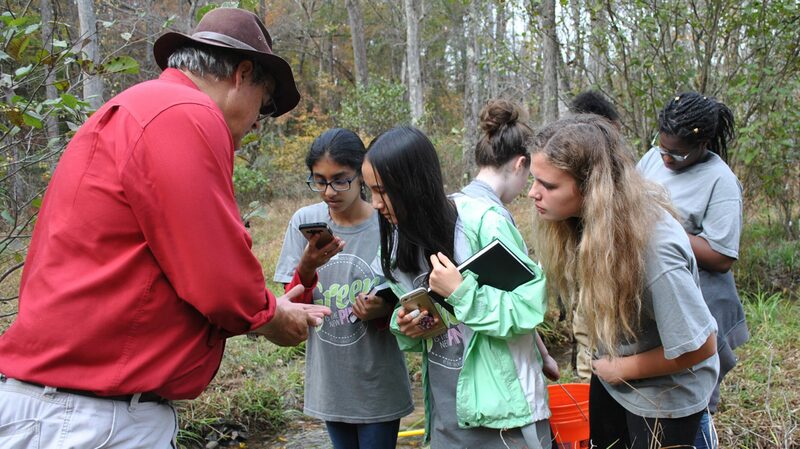 OXFORD, Miss.­­­ – If you know a seventh- to 10th-grade young woman who would enjoy spending Saturdays hiking by a local river, hunting for salamanders, fishing for rare species or tracking invasive organisms, she should check out the University of Mississippi’s “Green is the New Pink: Young Women Environmentalists in Action” program. The environmental leadership program, created by the UM Office of Pre-College Programs, gives students tools and resources to create positive change in their community, to encourage the adoption of resource conservation activities and to ensure the safety of our planet for future generations. “Last year’s participants had unique research opportunities and learned so much about the world around them that we wanted to be able to offer the program to a new group of students,” said Wendy Pfrenger, UM assistant director of pre-college programs. This year, Pfrenger and Ellen Shelton, pre-college programs director, submitted a grant proposal to the Mississippi Department of Wildlife, Fisheries and Parks to fund the program. The proposal was accepted last month. The “Green is the New Pink” program will give students a chance to explore different elements of the UM Field Station while collecting and examining data that they will later share with younger students who participate in the Ecology Day Camp program. “We think it is a great opportunity for the participants to share what they discover with the next generation of environmental researchers,” Pfrenger said. Shelton and Pfrenger are working with Scott Knight, UM Field Station director, to provide specific learning and research activities for participants. They will be working alongside Oxford High School teacher Angela Whaley, Corinth Middle School teacher Martha Tallent and Lafayette Middle School teacher Katie Szabo during the six Saturday morning activity days of the program that will take place this fall and in spring 2019. Students interested in participating in the 2018-19 program are invited to apply online by Sept. 20 at http://outreach.olemiss.edu/environment.